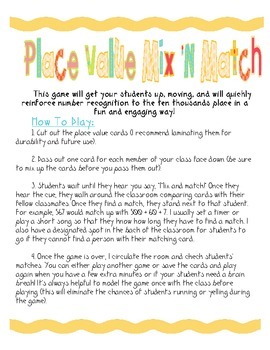 Get your students up, moving, and learning place value in a fun and engaging way! This game will reinforce standard form, word form, and expanded form of numbers to the ten thousands place and it only takes 5 minutes to play. This game is great to use as an educational filler activity. 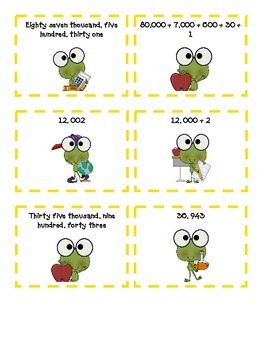 Attached are 30 cards with numbers written in either word form, expanded form, or standard form. Give each student one card. When they hear you say, "mix and match," they will circulate the classroom looking for another student that has the matching card. For example, 532 will match with 500 + 30 + 2. 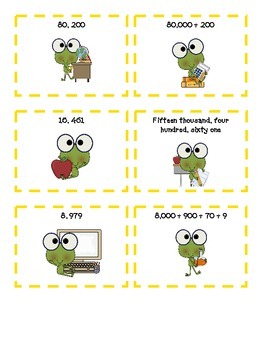 This download includes 30 mix and match cards as well as teacher directions. Enjoy!